Technicolor Color Certification Program: Marketing hype or genuine consumer benefit? Think back to the last time you bought a brightly colored item online: A laptop, a smartphone, a pair of shoes, a hat. How closely did the item displayed on your computer monitor match the color of the item you eventually unboxed? If you’ve ever purchased a blue sweater only to discover on delivery that it’s actually violet, or if you’re constantly frustrated because the pictures on your camera display look so different than they do on your computer monitor, you’ll appreciate what Technicolor Color Certification promises to deliver. This program is a collaborative effort between media-services company Technicolor and software developer Portrait Displays, and it’s intended to help ensure the colors displayed on your monitor match the actual colors of the objects depicted on them. How are these companies qualified to do that? Consumer-electronic devices rely on the sRGB color space. You’ve no doubt seen the Technicolor brand on many the movies you’ve watched over the years. The company has provided advanced pre- and post-production services to movie studios and television producers all over the world for decades. You might be less familiar with Technicolor’s technology contributions to manufacturers of set-top boxes, Internet gateways, and other connected-home devices. Finally, the company has amassed a patent portfolio deep enough for it to claim that 80 percent of all consumer-electronics devices on the market integrate one form or another of its intellectual property. OEMs whose displays and laptops earn Technicolor certification can bundle Portrait Displays' ChromaTune software with their hardware. As an application software provider (ASP), Portrait Displays develops custom display software for OEM display manufacturers. Its core strengths include advanced calibration, color management, and display-control technologies designed to enhance and ultimately improve the accuracy and quality of on-screen imagery. ITU-R Recommendation BT.709 was approved by the International Telecommunication Union Radiocommunication Sector in 1990. More commonly known as Rec. 709, it specifies resolutions, frame rates, and color parameters for high-definition television. Professional websites, digital cameras, and many other consumer-electronic devices rely on the sRGB color space created by HP and Microsoft in 1996 (and codified by the International Electrotechnical Commission in 1998) for monitors, printers, and the Internet. sRGB is based on the primary colors defined in Rec. 709. Toshiba's Satellite P55t is one of the first laptops in the world to feature a 4K display. It's also the first to be Technicolor Certified. If the display you’re sitting in front of isn’t properly calibrated, you won’t see the colors in a movie as the cinematographer intended, you won’t see the colors of the merchandise you’re considering buying as it exists in the real world, and your user experience will be diminished. According to its developers, a monitor that passes the Technicolor Certification Program must meet minimum gamut coordinate requirements that ensure the display is capable of delivering an accurate sRGB color gamut. Its white point (color temperature) must fall within 10 percent of 6505 degrees Kelvin, with minimum luminance of 150cd/m2 (candela per square meter), and gamma must equal 2.2 (+/- 0.1). Gamma decoding values basically determine a monitor’s ability to properly display shadow detail in an sRGB image. You can read more about the Technicolor specification at the company’s website. 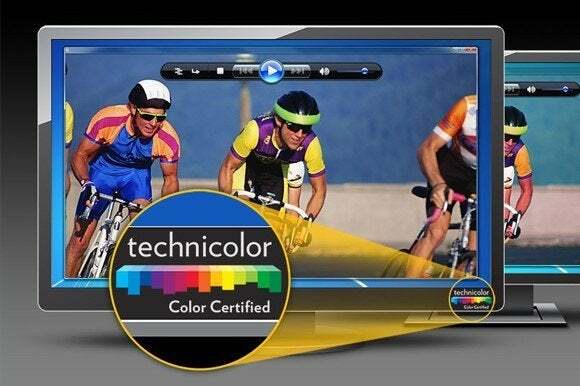 Technicolor contributed its film, DVD, and Blu-ray color-conversion know-how to the development of the certification program. Portrait Displays tests displays that OEMs submit in its state-of-the-art color lab, calibrating them if necessary to meet the spec. Portrait Displays also provides color-management and display control software that the OEMs can bundle with their certified products. Technicolor Color Certified systems and displays can operate in multiple modes, in case users want to calibrate the display to a different color gamut (such as Adobe RGB), or if they just have a personal preference. 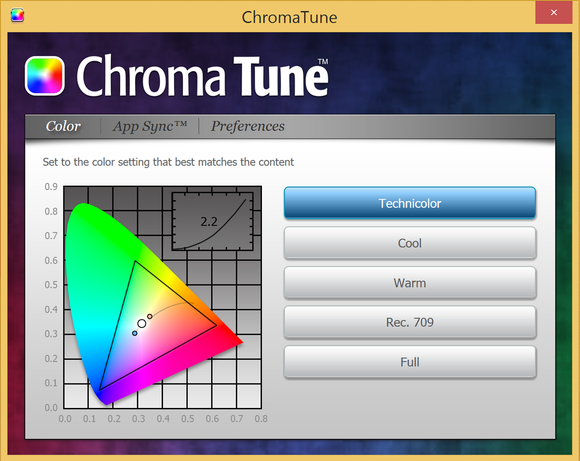 The user can switch modes using onscreen controls or with Portrait Displays’ Chroma Tune software running on their host PC (note that OEMs license the software and might brand it differently). The standard is designed for consumer devices, not professional equipment (the pros use other color-management tools). 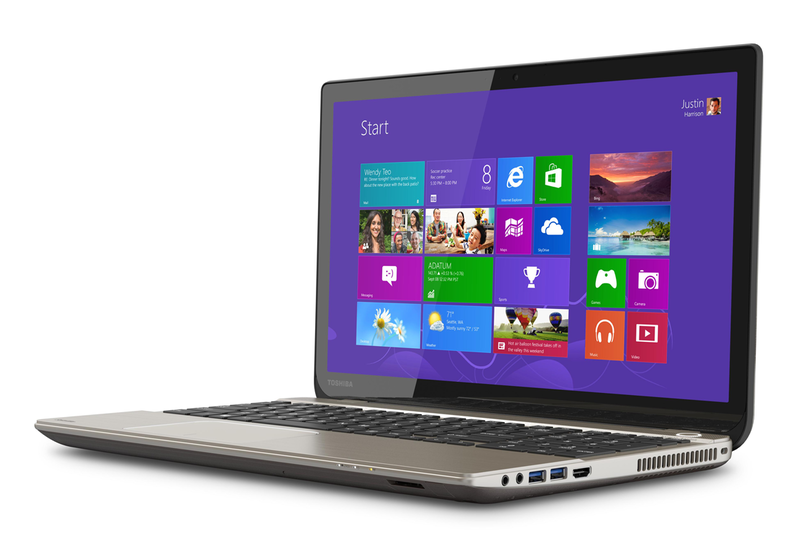 Toshiba’s Satellite P55t was the first consumer laptop to earn Technicolor Color certification, and HP’s Envy (23- and 24-inch models) and Pavilion (13 models ranging from 20- to 27 inches) were the first displays to win certification.